How Serious Is The Army About Fostering A Mentoring Culture Within The Ranks? … while formal counseling is important from an institutional perspective, informal counseling and mentoring are major factors in leader development. And that is something that needs to be fostered in an increasingly complex world, where even junior leaders need to make split-second decisions that have far-reaching impacts. The Army really wants, or should want, mentorship to flourish among the ranks with some understandable reasons. It may help a leader at any level not only gain been-there-done-that experience, perspective on career ambitions, and informal reviews of performance, but --- most importantly --- self awareness, all from a concerned, but objective, source. An active mentor sees an outlet to pass on experience, the profession of arms, and even a touch of legacy. Someone who actively seeks mentorship may be someone who appreciates the profession and seeks to deepen it, if only from his or her foxhole. Unfortunately, although we as Army leaders talk the talk on the importance of mentorship as a program, we struggle on implementation. Mentorships lives and dies on its voluntary nature, but we seem to force the issue and so cripple it. Mentorship is the voluntary developmental relationship that exists between a person of greater experience and a person of lesser experience that is characterized by mutual trust and respect. The focus of mentorship is voluntary mentoring that extends beyond the scope of chain of command relationships and occurs when a mentor provides the mentee advice and counsel over a period of time. There’s mentorship ensconced in Army regulation, almost mandatory, but still voluntary. Army Doctrine Reference Publication 6-22, Army Leadership, broadens on the topic. But it’s still doctrine --- recommended, but still voluntary. We say it’s important and acknowledge its value. But how serious is the Army and its leadership about implementing it? The My Army Benefits website, last updated two years ago, describes the Army’s mentorship initiative started in 2005, “...to encourage Soldiers and Department of the Army (DA) Civilians to engage in mentoring activities beyond the chain of command.” Trying to find additional information may lead an interested soldier to some disappointment since the link to the program site has a 404 error. Website links break all the time and Army programs come and go with leadership turnover, priority shifts, and funding reallocation. But if mentorship is a necessary, and essentially mandatory, thing for a professional force, the front door to the program is locked and the lights are off. Within Army Knowledge Online, the branch’s knowledge management portal, one may find the Army Career Tracker as an option for official mentorship assistance. The site has some benefits, such as a personalized outline of military training and civilian education completed to date while providing an automated individual development plan for career goals. While the Army has abandoned its mentorship program, it has adopted the career tracker as a venue for facilitating leader development. 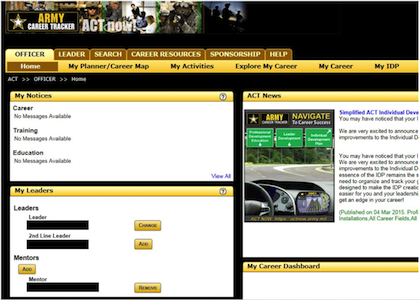 Screenshot of Army Career Tracker dashboard. This program appears to be a well-intentioned step in the right direction. The problem, however, is that this automated process notifies a potential mentor that there is a mentee out there who seeks guidance without encouraging the relationship beyond an automated email. More importantly, it sterilizes the mentorship process by replacing one-on-one, significant conversation with point-and-click generic timelines and unfocused advice. Digital mentorship isn’t exactly the same thing as facetime and legitimate concern for the individual or profession. If something is important, the Army sends a soldier to a school; if it’s a “block check,” it makes it an online quiz. If mentorship was an enforced program, the Army Career Tracker, like the Multi-Source Feedback and Assessment required during annual evaluation time, would become a pencil-whip drill or feedback sink where information and analysis go in and nothing substantial comes out. It’s no panacea to improving mentorship, but the Army Career Tracker is a limited tool to help it along. And it’s not the only way the Army encourages mentorship. Sometimes it tries to play matchmaker. Once as a small group leader and instructor of a captains’ career course, I experienced how forced Army mentorship can be. At regular intervals, the schoolhouse hosted the pre-command course for lieutenant colonels and colonels; those selected for battalion and brigade command or key staff positions on general staffs. Interested senior officers from that group would sit in with the class, give a little talk about being a leader (hooah, hooah), and ultimately allow for questions. Most student questions centered on the “What do I need to do to be successful in my next assignment” variety. The senior officers would always answer, generically but earnestly, and then offer up some business cards before they headed for the door. Maybe instead of mentorship, we should have labeled the program “Senior Officer Engagement Afternoon.” Certainly young captains can pull value out of frank discussion with senior officers, but the nature of this program belies the voluntary, informal nature of mentorship. Certainly mentorship isn’t for everyone. Despite the learning and growing organization the Army tries to be, hardliners who have everything figured out, in their mind, from commissioning to retirement, will never seek mentorship. Mentors may not be inclined to support them either. Some leaders, despite this attribute, are textbook introverts and may not see value in seeking extra professional guidance. As an introvert myself, finding reasons to open up is exhausting; doing so on professional matters is no different. A third group, and probably the largest, just has no interest in the process. Mentorship has a certain twinge of selfishness to it. It places a demand of time and effort on the mentor and focuses solely on the individual mentee. At the heart of the matter, the mentor and mentee may not see any value in the current program for the effort it takes to work. This generation is all about collaboration; wants to impact the greater good; and is not too interested in how things were done in the past. In fact, the top-down approach that characterizes many companies may be one reason for the high turnover rates associated with Millennials--the square-peg-in-a-round-hole problem. A lot of good comes out of collaborative efforts to include better, more comprehensive problem solving and greater ideas and thinking. Mentorship should be no different as a team of concerned leaders, concerned for the profession as well as each other. No website necessary and no need to force the issue. This wide-open collaborative environment mirrors with a focused purpose on growth of the individual and the profession has precedent in other areas. An applied example comes from Steven Johnson and his TED talk on the origin of good ideas. He offers the coffeehouses of 17th century England as a source of dialogue, shared ideas, insights, and collaboration. But the other thing that makes the coffeehouse important is the architecture of the space. It was a space where people would get together from different backgrounds, different fields of expertise, and share…..And an astonishing number of innovations from this period have a coffeehouse somewhere in their story…. We take ideas from other people, from people we've learned from, from people we run into in the coffee shop, and we stitch them together into new forms and we create something new. That's really where innovation happens. And that means that we have to change some of our models of what innovation and deep thinking really looks like, right. I mean, this is one vision of it. Open collaboration in an informal setting may be the source of good thinking that builds on a pool of good ideas and insights. This is the same place mentorship should occur as well.